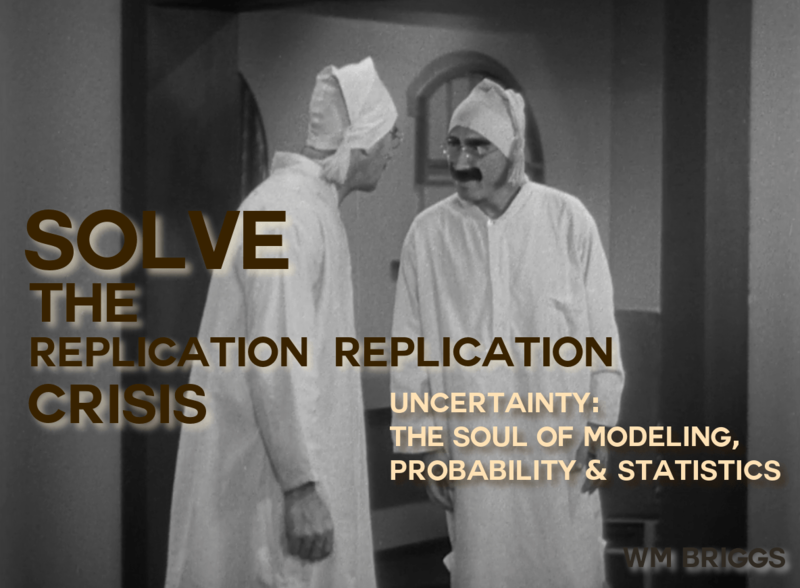 Scoot on over to Amerika, where there is an interview with Yours Truly, focused on the philosophy of Uncertainty: The Soul of Modeling, Probability & Statistics. You also write about how scientific research is heavily skewed by who is funding it or “purchasing” it as an end product, for example mainstream science articles. How prevalent is this? How can it be avoided or ameliorated? Go there to read the whole thing. Your mother would be pleased with you. “The government sets the agenda for nearly all science. I pulled the data together over a few moments while multi-tasking…so maybe I’m missing something – perhaps Briggs’ assertion applies to ‘nearly all science conducted by academia’? I could believe that. There seems to be some details missing. Anybody have credible, objective, data in this area? And you can’t get the money unless you want to play in the system the government dictates. Gotta admit that I have tried to play in the system that government dictates (assuming this is the case) and I fail to get the money. No sour grapes here, I can only complain the competition is fierce. “Too many monks, but not enough rice for them all.” (I am in the mood of killing the beauty of Chines language today.) Fortunately, I still can do what I like to do with paper and pencils and time is what I need. No, the government does not set the agenda for nearly all science. Propaganda! To be fair, R&D isn’t quite the same as academic science. Most R&D is in the ‘development’ side (engineering), not necessarily what most mean by the term ‘science’. Example – US Steel has a large research facility in Munhall, PA. Much of this facility is given over to engineering better ways of doing what the company is already doing. Certainly this is “research” in a very broad sense, but it is very specific to the field and results in trade secrets, not necessarily always published papers. Industry spending on research is often disparaged by academics precisely because it is seen as too practical. Computer Science is a great example where what is taught (basically “Math on Computers!”) is nothing like most of the jobs graduates get (“Improving Business via Computers!”). Academics see their *lack* of practicality as a good thing. Engineers & Programmers tend to disagree. This post was excellent! I hope it’s clear enough why this comment follows from the Q and A post because sometimes my thoughts appear “random.” It made me think of the following things amongst others. I copied this quote from Jeeves and wooster last night but it’s not true. So I don’t read another word the man says. It is ironic that the thing he’s claiming which goes wrong at the end of the first sentence is a generalisation. In any case he’s wrong about the sense experience too. It sounded interesting so I wrote it down to think..
One of the recurring situations I’ve noticed is when the confusion of an authority of some kind or an intellectual or teacher, teaches or feels a thing which makes no sense or is clearly fishy. It is easy to think that one doesn’t understand or is stupid. Especially when the source has told you that you are or is claiming that you don’t understand as they attempt to convey the falsehood with fanaticism. Of course sometimes people don’t understand but that’s not always the case. Trust and take the thing as true because you are surely too stupid to understand and you trust the source. A conclusion that whichever field is of no interest or concern anyway. and other totally justified and understandable attitudes towards the given subject. is even more a deterrent to discovering new and interesting things. Luckily most blindingly obvious things like the pillars in rome, (and I’m with Jonny on this one) are not that important, trivial, in the grand scheme. However, this explains the “strange” reactions sometimes from people being taught. Do you believe in universal Truth? There is an increasing push to merge the “academic” with the overtly “commercial”—to the point where entrepreneurs in the future are going to need some sort of accreditation before they are allowed to play the game. > The government sets the agenda for nearly all science. Well, (he quibbled) the government and political wanna-be intellecuturals at “Think Tanks” ranging from Brookings to CEI (and no, “B” to “C” does NOT represent a broad range of the entire alphabet, nor does the range of “thinks” in those “tanks” represent the totality of American thought. ) Big money purchases research and the answers obtained depend on the questions asked and the language used to frame the questions. Statistical case-in- ( immediate contemporary) -point: statistical sampling of the electorate in order to predict the outcome of elections. The GOVERNMENT per se does not pay for that data. But those-who-would-be governors (presidents, what have you) do a lot of such research. And in the most recent election the data seems to have been mis-analyzed and hardly predictive at all. The data you COLLECT depends on the data you EXPECT; and the buyers have very specific expectations indeed. Joy, studying universal truth in math is part of what I do for living. I am interested in people’s thoughts. Knew/know a pure maths professor who says all applied maths is a load of rubbish and that is not a misquote. On further questioning he couldn’t be persuaded that he was exaggerating. Perhaps he was being proud. It’s interesting how people can come to be so polarised on this. More intriguing than arguments about politics or theology in that one sense. One side must be right and one side wrong here, there’s no room for grey areas. Numbers aren’t vague! What’s the excuse? I can’t help thinking that the pure maths guy is right. A thing is either true or false. an experiment can show something, numbers on their own can count heads without doing anything more than collecting the data. (and saying nothing more.) What makes me angry is that I always thought this from the first time ‘we’ were made to plot pins and join them with rubber bands. I wrote a programme for o-level exam that plotted a bar chart from inputed data, probably using BBC basic. This was/is because sighted people need to see the lines and can’t find the biggest number without the pretty colours. Now I discover it’s because the truth is hidden behind the colours and lies somewhere else. “oh it gets much more complicated than this” you need graphs, to make things clear. “no we don’t”, thought I and the more I read the more I find this is true. We need statistics to make something seem true. The complexity is necessary! Shoot me down or consider me stupid, I’m past caring. (not about you JH, don’t take me the wrong way. I read the first five chapters of the BLOA book a couple of times up until computers were required so that I understood to that point but still am not convinced by why you would want to do some of this stuff in the first place. Is that the real reason everyone’s so upset? They’ve been wasting their time. They should look at things another way. They had a lot of fun along the way and must now go and find something more rewarding. Like teaching pure maths. Is everyone really like Jonny Vagus when they discover the truth? Richard Feynman makes a passionate plea and warning about the very problem Briggs is mentioning here in his commencement address known by the title, “Cargo Cult Science.” Must read.